Rosh Hashanah -- Happy New Year! Wow! What a whirlwind three days! It all started Wednesday night with erev Rosh Hashanah. We made a completely new seder and it worked out really well! Chandler had three friends over, and we invited three families. Although I didn't get all of the cooking done that I wanted (didn't have time to make the salmon patties or the apple walnut cake), everything turned out edible. The seder (upstairs) was just how I wanted it...short enough for the teens and little ones, participatory, and yet some element of meaning attached to it. The onion fritters with homemade tamarind sauce appetizer was a hit. Dinner was downstairs, buffet-style. We served poached salmon over succotash. That was my first time ever poaching salmon so I was glad that people ate it! I made a creamy citrus sauce to go over it. Creamy tomato soup, Hungarian cucumbers, roasted beets dressed with balsamic and olive oil, and tabbouleh. Rob made tea with fresh oranges, lemonade and had many wines from which to sample. The table was decorated with rose petals and flower arrangements, and the buffet and beverage stations had balloons with the continents on them. They were really cool! After dinner, the teens went upstairs where they played board games and talked. The middle schoolers went back and forth between playing alone upstairs and flirting with/harassing the teens. Downstairs, the adult conversation included themes such as prayer--personal and congregational, the selichot service, the speaker for that previous weekend at BA, the Conservative rabbis' strengths and what we can draw from them, prayer in Hebrew v. English, leadership themes in the seder and why, etc. What great conversation between Lisa, Jay, Erin, Ran, Jessica, Lee, Rob and I! I really enjoyed it. Meanwhile, the littlest ones played around the table or in the open spaces under the careful and carefree watch of the adults. It was leisurely and wonderful. Then came dessert! Oh wait...we benched first, led by Chandler. 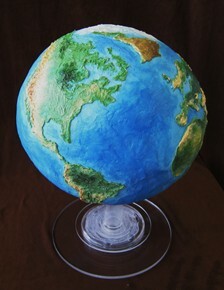 Then out came the cake...Erin brought a globe cake!!! It was awesome! All the kids came downstairs and we sang happy birthday to the Earth in English, Hebrew and Korean. Then we ate! We forgot to bring the ice cream down. Whoops! It didn't seem to matter--we were all hyper-focused on the cake. It was delicious on top of looking great! By this time, it was getting late and Neviyah was not happy about anything. I took her upstairs to put her to sleep. I guess it took about 15 to 20 minutes. When I came out, people were getting ready to leave, and I don't blame them! It was getting late. Rob had already taken one of Chandler's friends home because he had to leave at 9 p.m. I don't know what time it was but it had to be around 10 maybe? Chandler's friends had a good time from what I could tell and more importantly, so did Chandler. He said it was perfect. Exactly what he wanted for a Rosh Hashanah seder evening. The middle schoolers seemed to have fun, considering they were begging for a sleepover at leaving-time. I hope the adults had a good time, too. There were enough leftovers for lunch the next day so that was an added plus. Overall, from a host perspective, the night was a success. Thank you to all the people who shared first night Rosh Hashanah with our family--Lisa, Jay, Erin, Ran, Jessica, Lee, Nadar, Devin, Aviva, Noah, Juliet, and Bianca. You really made it extra special. I hope we can do it again next year! Next post...Thursday's High Holiday sermon at B'nai Amoona...stay tuned!